Klaus-Jürgen Etzold (born 1959) works as director of music at Studienseminar Hannover and at a grammar school. Since 1995 he has also worked as honorary professor for music pedagogics at the University of Music, Drama and Media Hannover. He studied music education (school music), pedagogics, English language and literature and musicology in Hannover from 1978-1986. From 1978 until 1986 he was artistic associate of Prof. Heinz Hennig with Knabenchor Hannover, in 1980 co-founder of, and until 1985 a singer in the Orlando di Lasso-Ensemble Hannover. He participated in conducting classes by Helmuth Rilling, Laszlo Heltay, Marinus Voorberg, Eric Ericson, Gary Bertini and Andrew Parrot. In 1994 and 2006 Etzold received the conductor's prize in the international choir competitions at Riva del Garda (Italy) and Torrevieja (Spain). 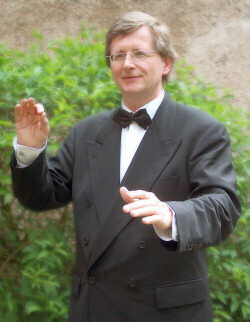 He is frequently asked as member in juries and has also given classes in early music, music pedagogics and conducting in Germany, Croatia (1999-2002) and Madagascar (2008, 2009). He is co-editor of the choral book CHORISSIMO and also a member in the Choral Board (Beirat Chor) of the German Council of Music. In addition he is a member in the artistic board of Hamel Stiftung, a foundation for solo singers.